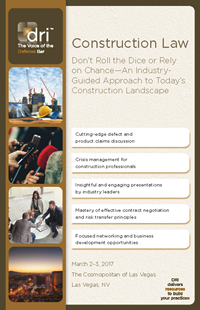 The DRI Construction Law Seminar is designed to educate all construction industry professionals—from experienced attorneys, to risk managers, to executives and construction industry professionals. This year’s program is an exceptional learning and networking opportunity that focuses on the practitioner staying abreast of industry trends, honing the skills necessary to maintain a competitive advantage in contract construction and litigation, and collaborating with other industry professionals. We have assembled a group of widely recognized industry professionals who will share their expertise in a variety of entertaining formats. You will gain valuable insights in the areas of construction law, risk management, insurance coverage, and industry trends. With its balanced learning and networking opportunities, this seminar is a must-attend for those involved in the construction industry. Please join your friends at The Cosmopolitan of Las Vegas.